Piketon resident Elizabeth Lamerson and her sons near the air monitoring station she purchased because of concerns over operations at the Portsmouth A-plant visible in the background. Lamerson insists despite her concerns she does not want - and shouldn’t need - to leave her family farm. Piketon Village and Scioto Township are both in the process of setting up air testing stations to monitor the quality of air coming from the site of the defunct Portsmouth Gaseous Diffusion Plant in Piketon. Spencer said Piketon Village Council recently approved $5,000 for the purchase of an air monitoring station. Spencer said it should arrive in about two to three weeks. Officials have not determined where exactly the device is to be located. Spencer said it is his understanding Scioto Township officials also approved such a purchase. The Daily Times was unsuccessful in reaching those officials. Spencer and others have expressed concern what will happen when Fluor-BWXT (also known as FBP), the contractor charged by DOE with dismantling the mammoth former uranium enrichment plant, actually begins demolishing some of the huge buildings on the site. According to several sources, the first building in line to be torn down is what’s been labeled the X-326 process building. “The company (FBP) has recently notified us that the DOE has moved up isolating (cutting off all utilities) in the X-326 (building)… Which means whatever is left in the building at that time will be placed in the waste cell,” John Knauff, president of the Teamsters local which works at the demolition site, wrote in a November letter to DOE Secretary Rick Perry and shared with the Times. Knauff contends the building still contains a large amount of process equipment once used for high assay, or high level, uranium enrichment. He further argues the building contains large amounts of transuranic contaminants. Knauff does note the presence of transuranic waste is normal for that building. It is unclear when FPB intends to tear down X–326. A company spokesperson did not respond to voice mails asking that question. At a November DOE open house in Portsmouth, FBP scientist J.D. Chiou and DOE’s Johnny Reising said water and dampening techniques will be used to control dust raised by any demolition. They also said water would be collected and treated locally. Spencer said the village will spend about $300 a month to process and replace filtering equipment in the air monitoring station once it becomes operational. Piketon and Scioto Township leaders are not alone in having set up or getting ready to set up their own air monitoring systems near the former enrichment plant. Calling herself a concerned fence line neighbor, Piketon resident Elizabeth Lamerson said she has spent about the same amount as Piketon, in other words about $5,000 so far, on setting up an air monitoring station on her property near the plant. Lamerson said she set up the unit some time ago and told the Daily Times she wants to get a year’s worth of baseline measurements to which she can compare later readings. “I’m not sure we’ve got a year to wait,” Spencer commented. Lamerson has been a vocal critic of DOE and FBP. She has shared with this newspaper numerous emails between herself and DOE spokesperson Yvette Cantrell. The vast majority of the emails simply spell out Lamerson’s frustration with an alleged lack of response from DOE and Cantrell to questions posed on air quality and other issues. In response to questions raised by the Daily Times, Cantrell supplied several pages of a 2017 air quality report prepared by DOE. The report states in part ambient air is monitored at 15 different stations located on the plant site, at the site perimeter, within the local area and west of the site in an area described as not potentially impacted by operations. DOE states samples are analyzed monthly or quarterly for radionuclides associated with plant demolition and decontamination operations. In its report, DOE defines radionuclides as transuranics, that is, man-made elements with atomic numbers greater than 92. These include materials such as plutonium and uranium. The report admits uranium, uranium isotopes and at least two other radioactive materials were detected at the air stations in 2017. However, the report goes on to claim the highest levels of each radionuclide in the air was 0.08 percent or less of the DOE derived concentration standard. Again, although the report seems to become somewhat technical at this point, the overall conclusion was the dose measured is, according to DOE, far below allowable limits. In her email, Cantrell said a full Annual Site Environmental Report (ASER) presumably for 2018 is currently in production for public distribution. Piketon resident Elizabeth Lamerson and her sons near the air monitoring station she purchased because of concerns over operations at the Portsmouth A-plant visible in the background. Lamerson insists despite her concerns she does not want – and shouldn’t need – to leave her family farm. 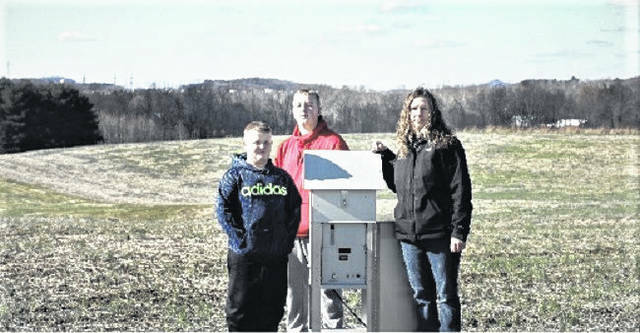 https://www.portsmouth-dailytimes.com/wp-content/uploads/sites/28/2019/01/web1_Lamerson-2.jpgPiketon resident Elizabeth Lamerson and her sons near the air monitoring station she purchased because of concerns over operations at the Portsmouth A-plant visible in the background. Lamerson insists despite her concerns she does not want – and shouldn’t need – to leave her family farm.